Pride 2018! What a day to be proud! As an Allsorts member of staff I felt proud of our community, our young people, the staff team and the city of Brighton and Hove! Arriving at Hove Peace statue was a magnificent sight – a large group of young people from Allsorts all buzzing together waiting for staff. Many of the young people had made a nod to the rainbow and or trans flags this included rainbow socks, a poncho, dresses, shoe laces, face paints and trans and rainbow flags worn as capes! A wonderful colourful ensemble. The energy was positive and electric in anticipation of the day ahead. Our bus awaited us and we were ready to go! The bus was strongly identifiable as the Allsorts bus with our branded banners and glittery tinsel both catching the light. The community volunteers were ready with anticipation for the day ahead. Our four wheel-stewards were prepared for the hot and long walk- some even took up our offer of the rainbow head umbrellas and styled them well! A massive thank you to the wonderful stewards, and our amazing bus driver, as without them we would not have been able to be in the parade with the bus. We had thirty young people on the bus, eight members of staff, seven volunteers and a Trustee with us for the duration of the event. At moments there were whole groups of people in the crowds whistling and cheering for us and without a doubt rooting for what we do. We in turn cheered and whooped to the crowd. I especially enjoyed whooping for young people who I saw in the crowd- especially when I was on the lower deck and almost right next to them. Any one of the young people watching us could well have been LGBT and not out…I hope and believe that our presence will have made young people (and maybe adults too) feel that they are not alone! 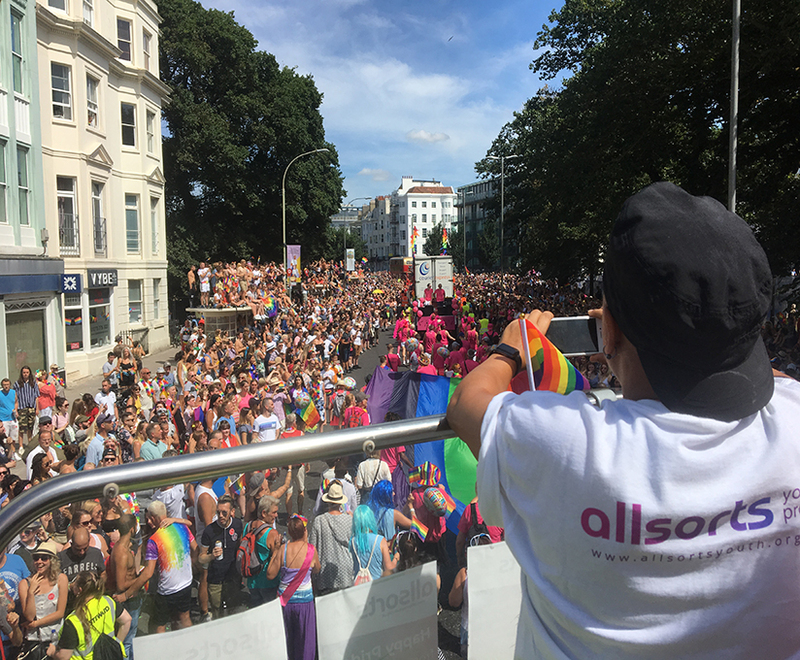 That maybe young people out there might approach us if they saw us in the parade, that they too may get to experience the wonderful energy and welcoming that Allsorts offers to young people. 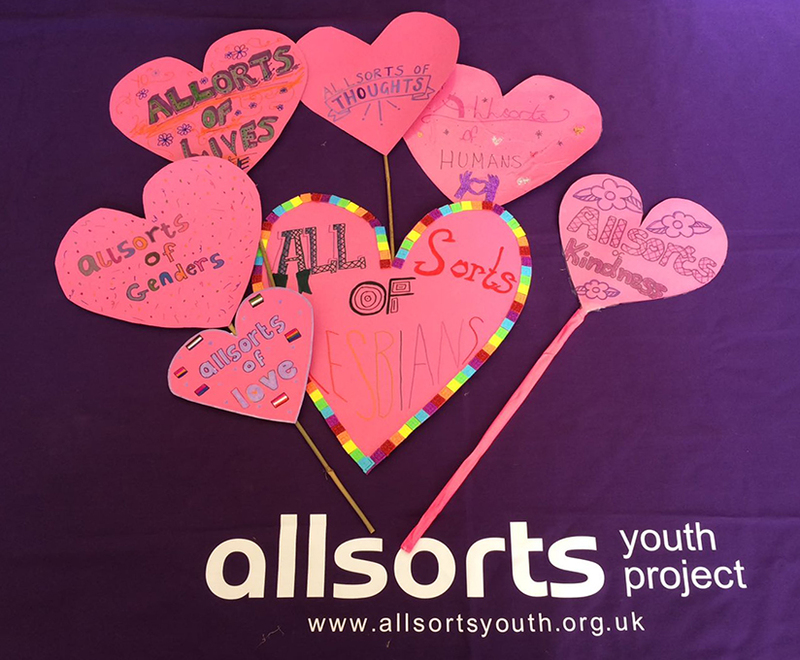 Allsorts truly is a space for young people to come and be themselves without judgement. One of my highlights was going under the railway bridges on London Road just near to the park and a row of about a dozen young people (secondary school aged) were all sat on a ledge and directly cheered and whooped at our bus! We do make a difference! We were seen, and supported and we put smiles on people’s faces! And our chanting definitely got some grins! A huge thanks to everyone who made our Pride season this year such a success! People have been donating their time and money to help us continue the important work that we do. Read all about those who've made a difference here.